With the goal of using interaction design to improve people’s decision making in disaster situations, designers Amelia Koster, Brittany Williams and I created a library of disaster design principles. Municipalities are usually in charge of putting together preparation programs and responding when events arise. However, not all municipalities have the resources or designers on their teams to bring forward user research or behavioral economics. 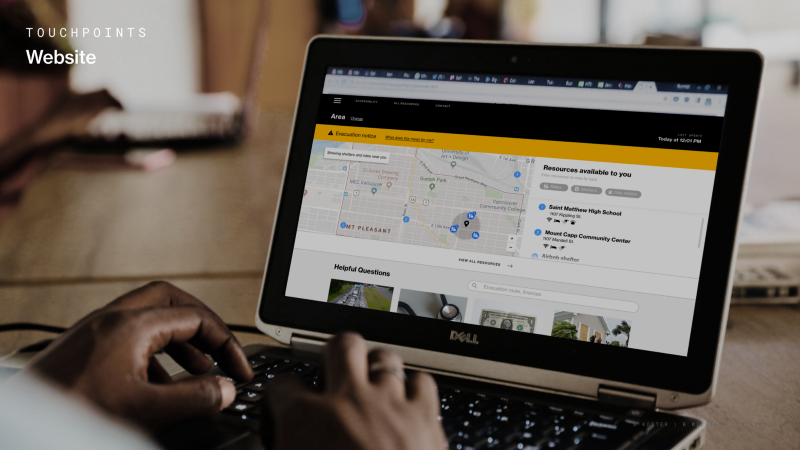 Disasterdesignprinciples.com acts as a starting point or as a user-centered checklist for municipalities and teams working on their own people facing systems. 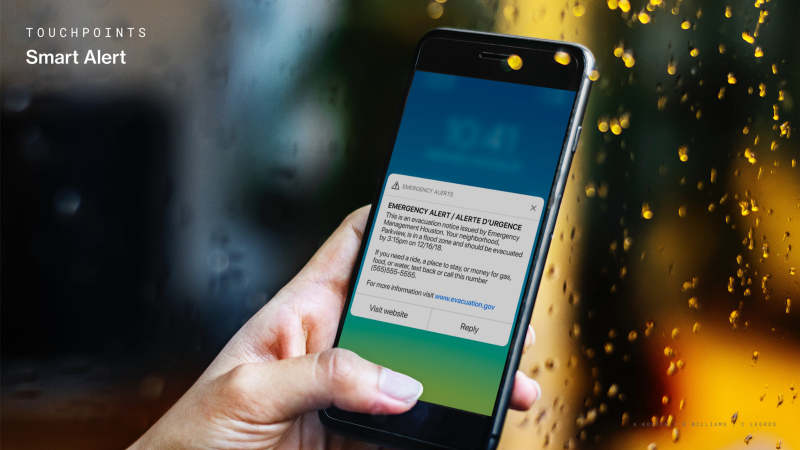 It’s been presented to the British Columbia government and is moving towards becoming an official resource for BC municipalities. 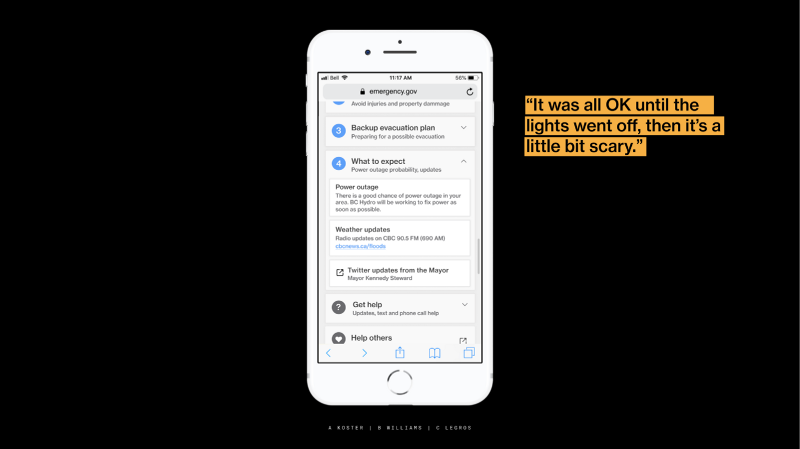 We’ve organized the insights under 4 main principles pillars: Designing for all, Challenging assumptions, Leveraging existing tools, and Considering people’s context. Under each pillar are more specific principles that are illustrated with design examples and supported by research. For instance, below is the “Make it multilingual” detail page. 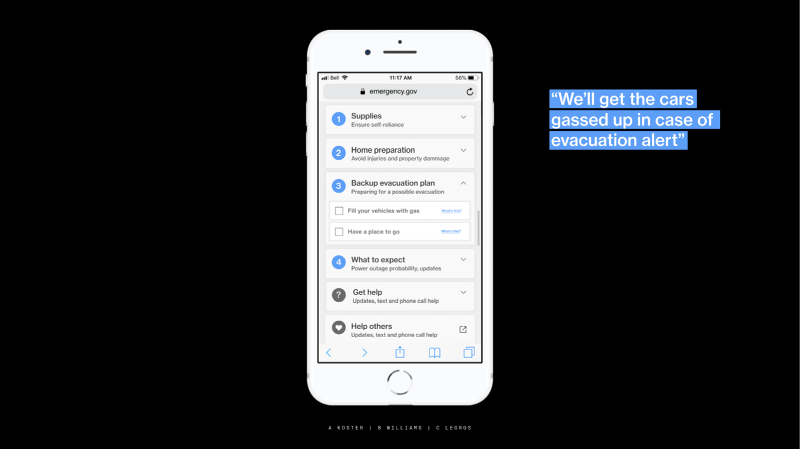 For 8 months, we looked at where interaction design could help in disaster preparation and evacuation. 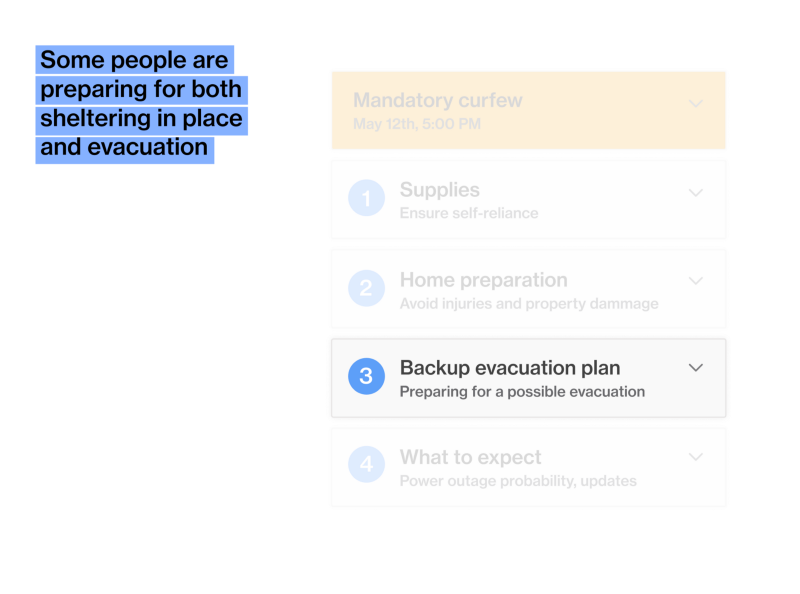 We found the decisions people made had the biggest impact (for instance, whether or not to evacuate, and how to prepare) and there is power to influence those decisions through design. 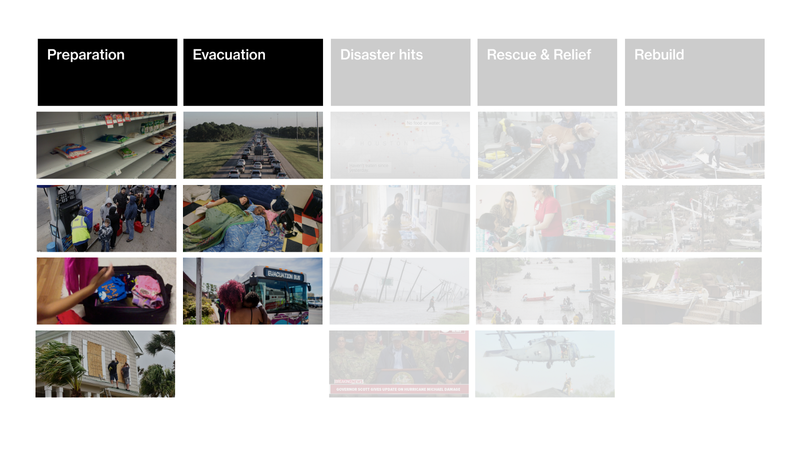 We focused on disasters with evacuation windows, such as forest fires and floods, to start our research. 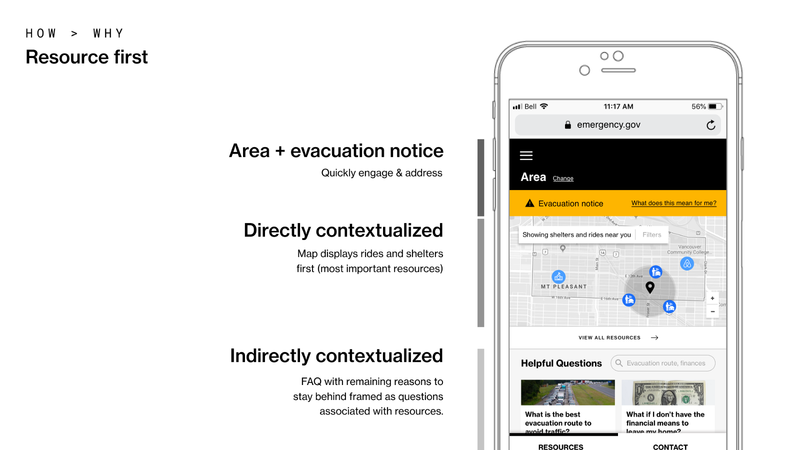 Using interaction design to improve people’s decision making in disaster situations. 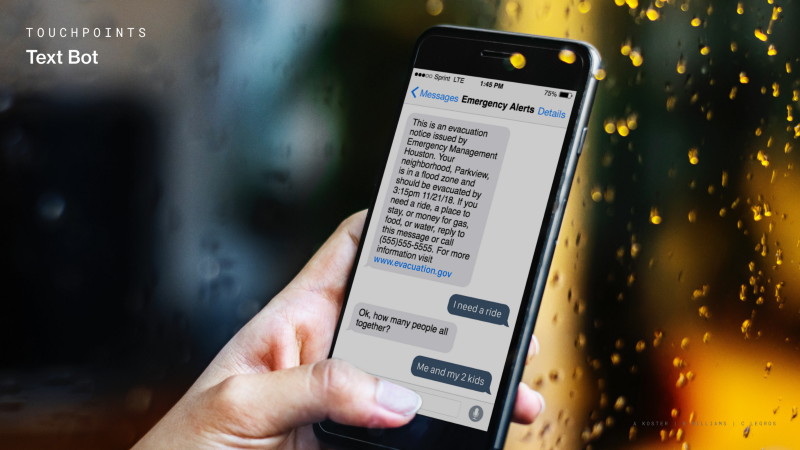 An umbrella pain point for people in a disaster is knowing what to do and who to listen to. We also found the systems in place sometimes didn’t take full advantage of community structures or technological systems people are already relying on. 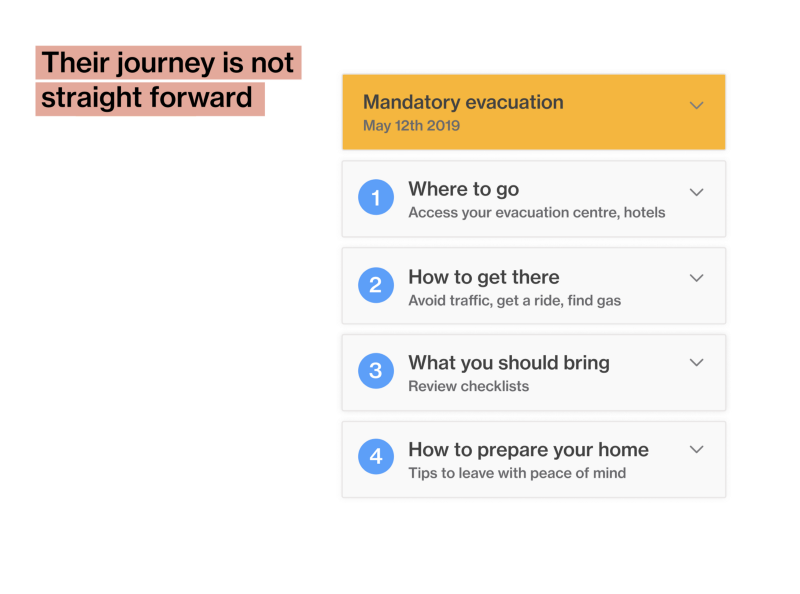 We started by researching and designing an evacuation tool focused on offering contextual resources, which would have several entry points and touchpoints, to make sure it reached the whole population. The tool was good enough at meeting these specific goals, but we were overlooking a lot of the reality of a disaster. Because it’s hard to test on or access people in these situations, it seemed difficult to know how things actually go down; what the journeys are, the decisions, the emotions, the challenges…We learned a lot from people who were sharing their stories retrospectively, but it didn’t reflect the step by step journey. 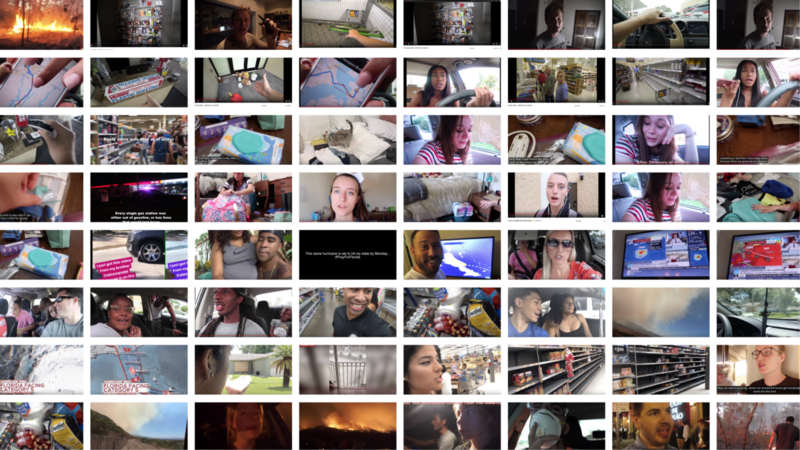 We found YouTube vlogs were a good way to get the whole journey; we watched over 7 hours of evacuation and sheltering in place stories from dozens of diverse individuals and families. 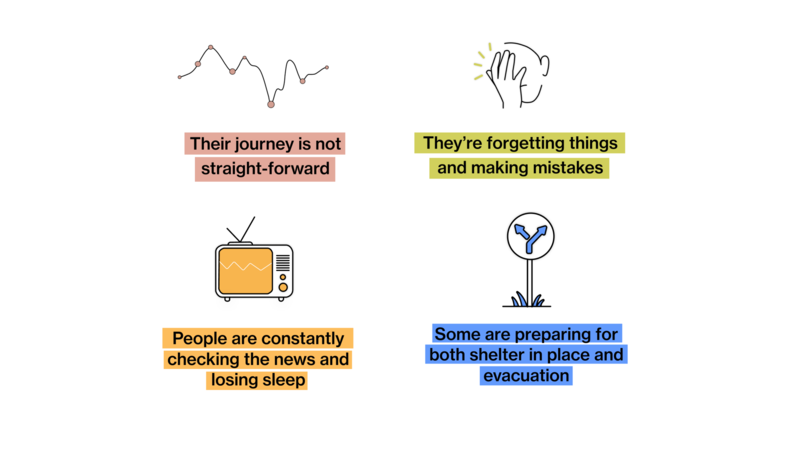 Through the videos, we realized that by focusing on evacuation, we were ignoring the broad range of people that didn’t need to evacuate but were in a hurricane corridor. These people would be asked to “shelter in place”, which means staying home while the hurricane passes. To do so, they would need supplies and need to prepare their homes, they would have a curfew, and might eventually need to evacuate. They too would have to go through several steps and decisions to ensure safety. We created a new tool that was more aware of these considerations. Although people’s journeys weren’t straightforward, they would all go through similar stages. We answered this by organizing these stages into clear steps to make them appear more manageable. This layout would also help with stress and create a comprehensive dashboard. 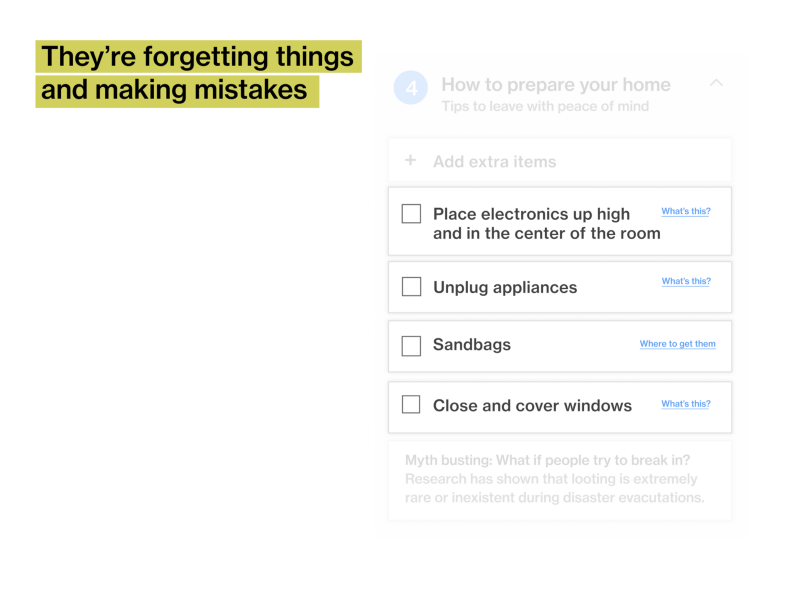 We organized some of the content through checklists that are customizable so people don’t have to rely on their own memory. Checklists also offer the opportunity to put forward our own recommendations. 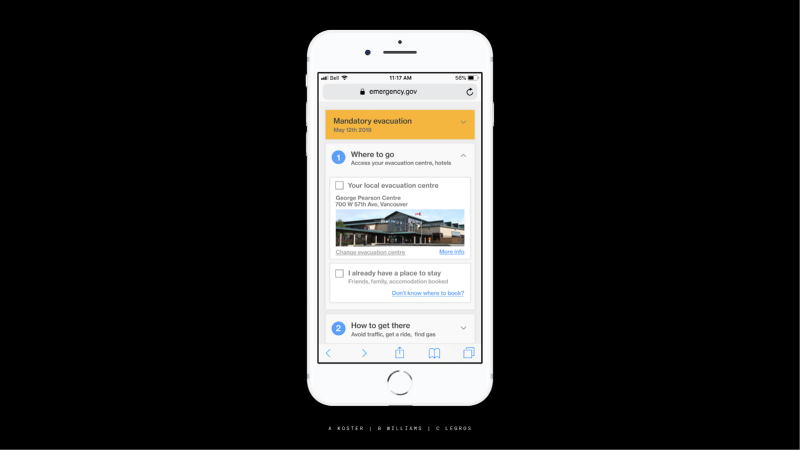 We answered the need for updates by offering clear, local sources for it. 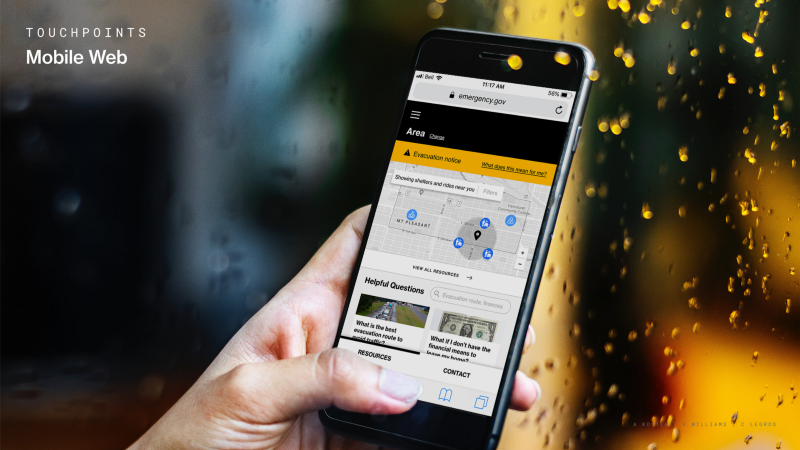 We tweaked the tool for sheltering in place, addressing the chance for evacuation. We had the same approach as for our first tool making sure it had several entry points and touch points but went even broader with a campaign and a starter kit. Here, there was a focus on community resilience and changing the culture of preparedness. Moving away from gathering only material and encouraging networks building, as we found through research that these prove to be much more impactful than a 72-hour kit. How is this more than just pretty mockups? We had made a series of tools, they were polished and user tested. But was this useful for the real world? Could every municipality put this much resources into a service? 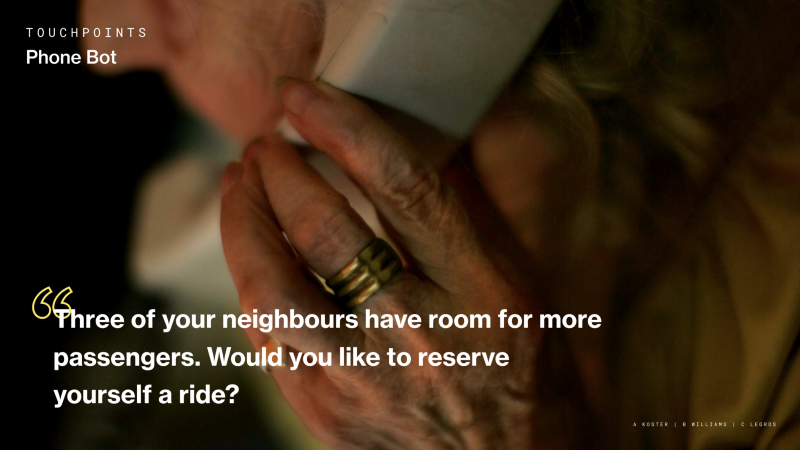 Have a population that would respond to our high-level tool? We realized that what the municipalities could really use here, was what’s behind this tool: The guiding principles, the research. 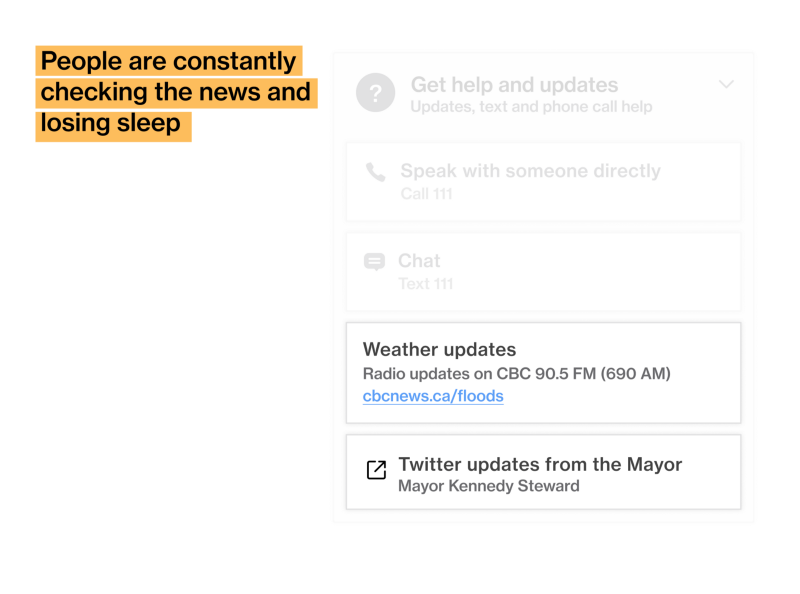 This need was highlighted when speaking to Katia Tynan at the City of Vancouver’s Resiliency Office. She shared with us several insights and common misconceptions. 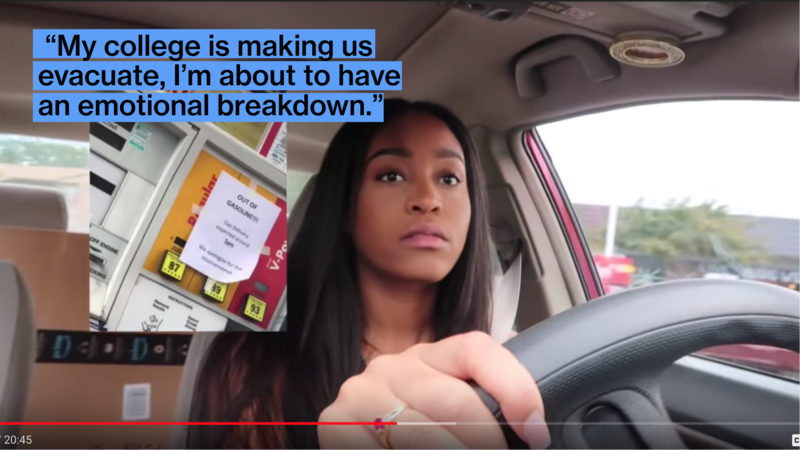 When we asked if there was a place where all that information was gathered, she replied there, unfortunately, wasn’t. We put together all of our research informed insights and created a design principles library using our own user-tested designs to illustrate them. Our guiding research: Reports, frameworks, stories, behavioral economics, precedents, and user research. 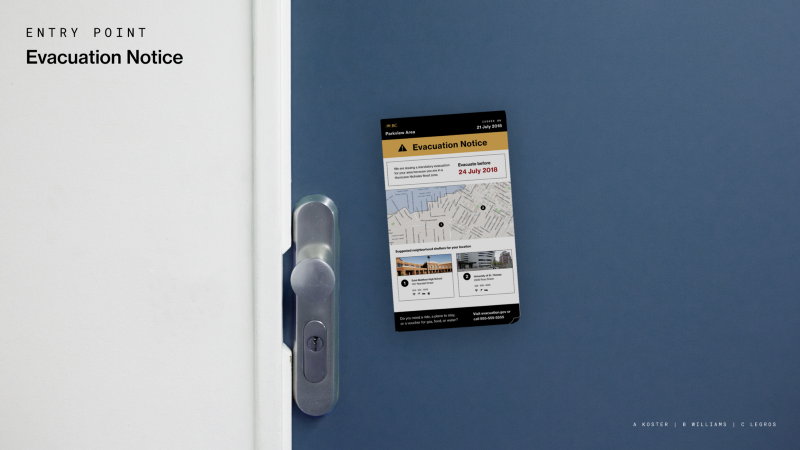 To illustrate the principles, we initially used our own design, highlighting the important part of it. Through user testing, we found it asked the audience to understand the larger context of the tool. 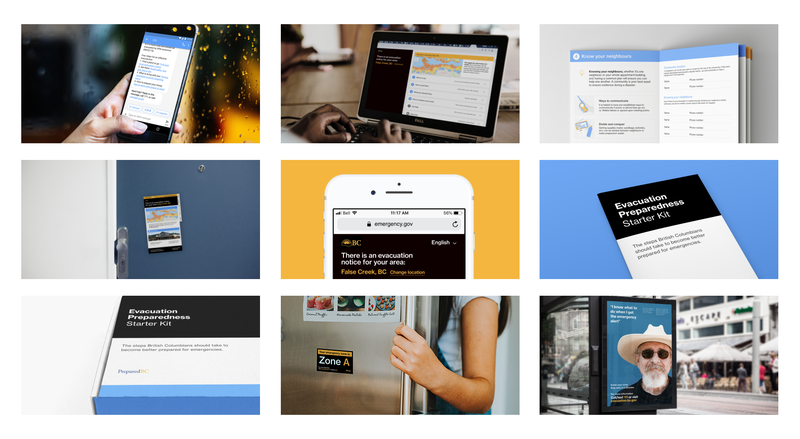 We simplified these interfaces to make the most relevant feature salient, through blockframing. 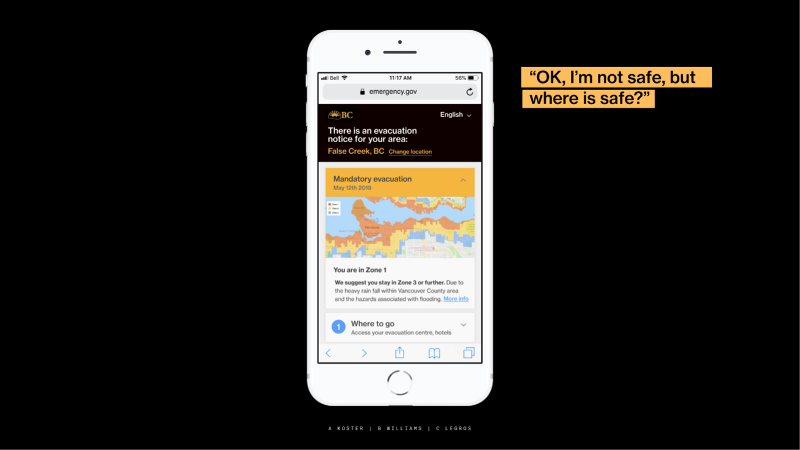 Illustrating the principles through abstract UI. 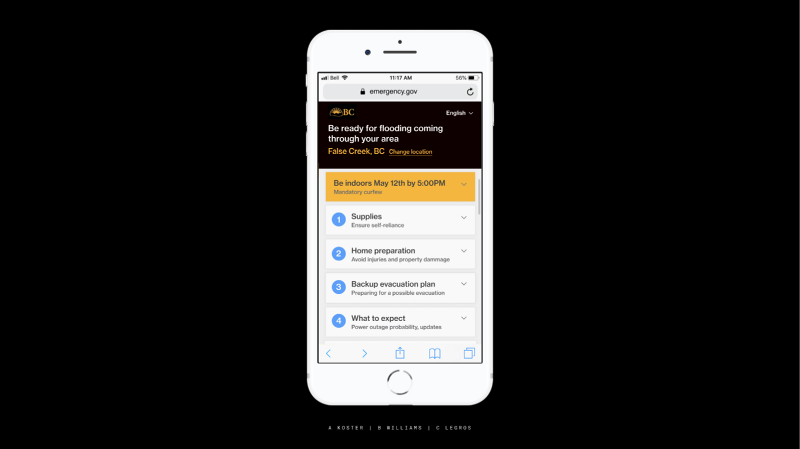 Our initial goal was to use interaction design to improve people’s decision making in disaster situations. 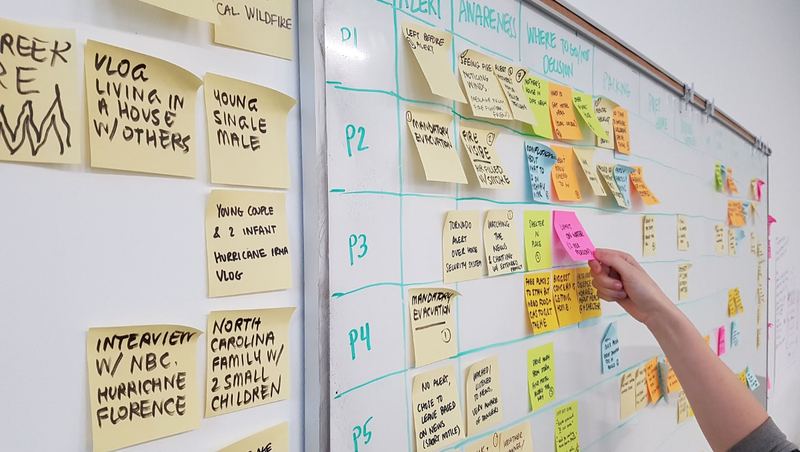 The website we created helps teams incorporate interaction design insights (through user-centered principles backed by research) into their systems, which in turns makes these teams influence positively the decision making of the populations they’re planning it for. We got to witness the scale and quality of work that can be attained through months of continuous work. We learned to navigate a space that had no easy answer and to constantly question our own directions to ensure we’d create something actually useful. It created moments of doubts, which we embraced and pushed through by reaching out to professionals and ideating/researching further. Working as a team added a level of complexity in the process, requiring strategy and alignment, which we smoothly handled. Our team was productive, well-rounded, and we had fun throughout. We leveraged each member’s skills to their fullest and produced a number of deliverables that are reflective of the team’s talents and work ethics.